This Nativity scene is hand-carved and detailed in a fine-grain earthenware ceramic material by Artesania Rinconada in Montevideo, Uruguay. The set includes Joseph, Mary, baby Jesus, a pig, a lamb, a ram, a village girl with a plate of fruit on her head, a flamenco dancer, and a boy with sombrero accompanied by a puppy. The figures are finished with 18K gold and platinum accents. Joseph measures 4 inches tall. 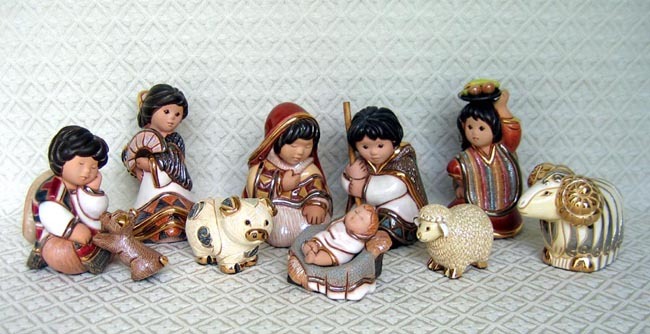 Jesus & Javier Carbajales, twin brothers from Montevideo, Uruguay, have been producing their handcrafted Rinconada figures since the early 1970s. After the figures’ initial kiln firing, decoration continues with the hand-application of colored slips and enamel glazes used to accent and highlight individual design characteristics. Each enamel glaze must be re-fired individually in order to preserve its distinctive coloration. Because they are all hand-carved and -painted, no two figures are exactly alike.